Containment Procedures: SCP-XXXX is to be kept in a locked box which may not be opened without approval of at least one (1) level-4 personnel and may only be used for tests. No physical contact is to be made with the object outside of testing procedures, which may only be performed by Class D personnel under supervision. In the events of such test a medical team must be kept nearby at all times. 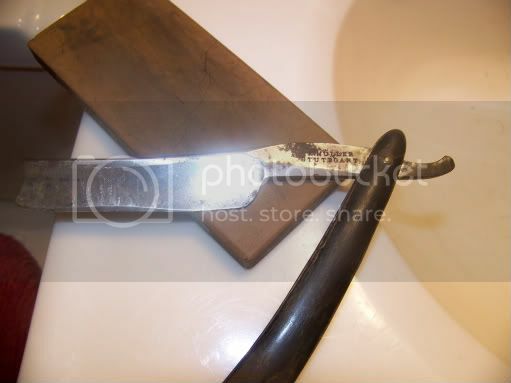 Description: SCP-XXXX appears to be an old-make straight shaving razor, estimated to have been built during the 19██'s. It seems to be impervious to blood stains. Weight tests shows that it is built of simple wood and surgical steel, or in a material of the same mass. The blade interacts like any other surgical steel blades when in contact with materials, but becomes extremely sharp when applied upon any living being, as shown during [DATA EXPUNGED]. Retrieval: SCP-XXXX was retrieved from a house in Quebec, Canada at ██/██/████. The owner of the house, ███████ P. was found dead with a large cut in the left cheek. Autopsy showed signs of drowning, with the lungs partly filled with blood. DNA test showed the blood in question belonged to ███████ P. The victim's veins also seemed to have been completely emptied. It is not yet determined if the loss of blood or the drowning caused the death first. ███████ P.'s cadaver was found in his bathroom which was flooded with the same blood found in his lungs. His body had to be burned with napalm [See Addendum-A|. Addendum-A: Suggest that are cut by SCP-XXXX seem to continuously bleed from the resulting wound. The blood flow doesn't stop even when the subject's blood has been completely emptied from it's veins. Severing the wounded part does not stop the bleeding. Tests have shown that burning the tissue surrounding the bleeding wound can stop the bleeding. Napalm is currently the most effective.